Malicious apps can steal info, damage devices, and give unauthorized remote access. App threats are specific applications created to steal information, damage a device, or provide unauthorized remote access for the purposes of surveillance and monitoring of a target. Common examples include legitimate applications that have been trojanized or injected with malicious code, malware that gets on the device through exploitation or careless user permission, or abusive apps with masked intent. Over the fourth quarter of 2016 and first quarter of 2017, 47 in 1,000 of Android enterprise devices protected by Lookout encountered app-based threats. Device threats have significant potential to cause catastrophic data loss because they break through a device's app sandbox and embed themselves deep in the operating system to achieve heightened permissions for the attacker. The Pegasus spyware is the most relevant example of a targeted, low prevalence, high impact threat. This device threat exists on both iOS and Android and is capable of activating a phone’s cameras and microphone to snoop on conversations around the device. It can also track a victim’s movements and steal messages from end-to-end encrypted chat clients. Attack examples include Man in the Middle (MitM) attacks, certificate impersonation, SSL/TLS stripping, and SSL/TLS cipher suite downgrades. Over the last year, fewer than 10 in 1000 (.8%) enterprise devices encountered a man-in-the-middle threat. Even well known software development companies release apps that contain vulnerabilities. Mobile apps have vulnerabilities just as PC software does, but vulnerabilities are a significantly bigger problem on mobile because most mobile apps are selected by end-users and are more likely to be built by small teams of developers. PC applications on the other hand, are more likely to be vetted by IT and developed by large software companies. Mobile device vulnerabilities are defined by the growing universe of known vulnerabilities. Every month both Google and Apple release a security bulletin detailing the increasing number of patches for new device vulnerabilities during the previous month. Nearly every "software update" notification contains security updates to patch new vulnerabilities. Vulnerabilities that are not found first by the security community can lead to zero-days that are then exploited by professional espionage organizations like what the NSO Group did with the Trident vulnerabilities and Pegasus spyware originally discovered by Lookout. Enterprises can measure risk from device vulnerabilities by tracking their “vulnerability window,” or amount of time it takes from the release of a new patch to full adoption of that update in their mobile fleet. Generally, mobility programs based on BYOD tend to have a longer window than COPE and Android-heavy device fleets are longer than iOS. For example, iOS 10 has reached over 90% adoption in just 8 months. 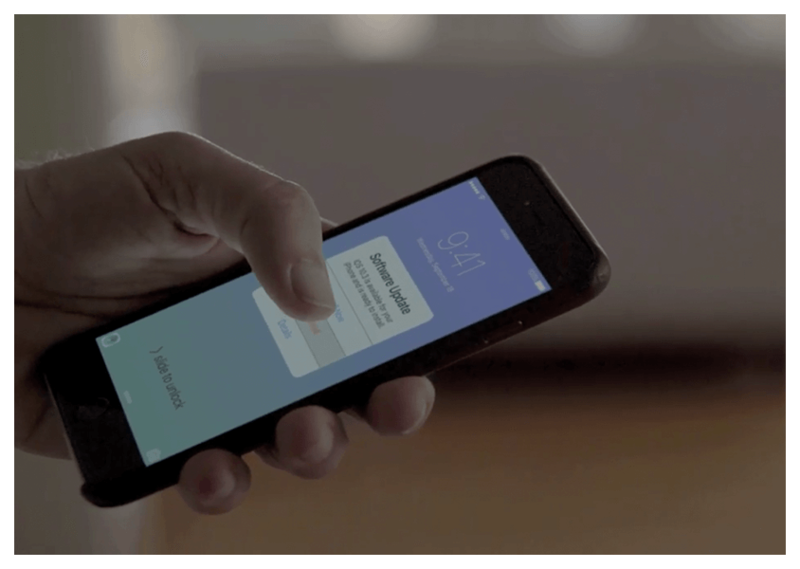 In a recent talk from Black Hat Asia, researchers showed how to, "exploit an iOS device remotely via Wi-Fi without any user interaction, completely bypassing the iOS sandbox." Even more recently, Apple issued iOS patch 10.3.1 to correct a code execution flaw that could be exploited via Wi-Fi. 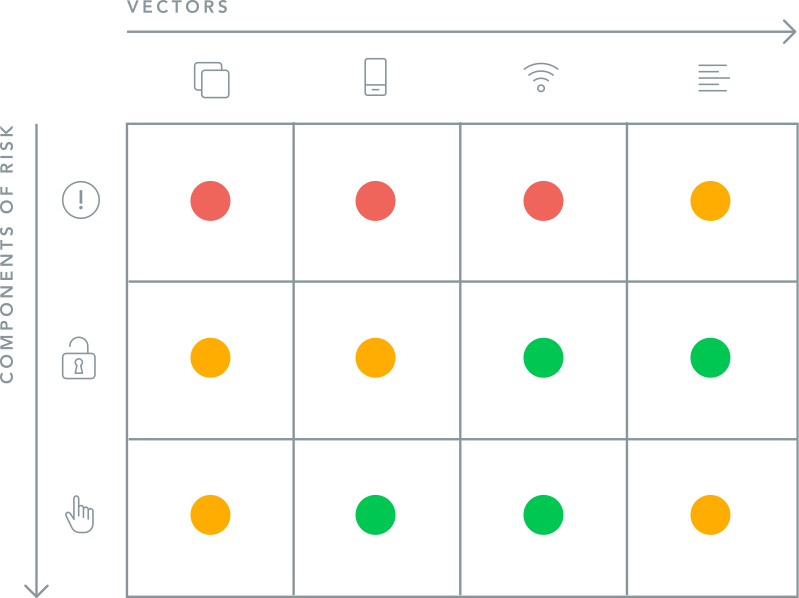 This vulnerability could, "allow an attacker within range of a vulnerable device to exploit a stack buffer overflow flaw in iOS and would allow arbitrary code execution on the Wi-Fi." The bottom line for enterprises is that there is a risk from mobile network vulnerabilities, primarily from public Wi-Fi (though is not a requirement for some exploits). As of April 14th 2017, 57% of Lookout Personal iOS users do not have latest Wi-Fi patch (based on Personal iOS OS update numbers). Malformed content, such as videos, and photos can enable unauthorized device access. The best way to understand web and content vulnerabilities is that any malformed content, including web pages, videos, and photos, can trigger specific vulnerabilities to exploit targeted application or OS/system level components to gain unauthorized access to a device. App behaviors and configurations have the potential to lead to leakage of enterprise data to which the insecure application has access. Data leakage, in addition to having a high impact to the enterprise itself, can also pose a significant regulatory compliance risk. Examples include applications that both access sensitive enterprise data and public cloud based storage services that are not under enterprise control, or applications that would have access to data with compliance requirements such as credit cards or records with personally identifiable information without adequate protections in their use, transmission, and storage. 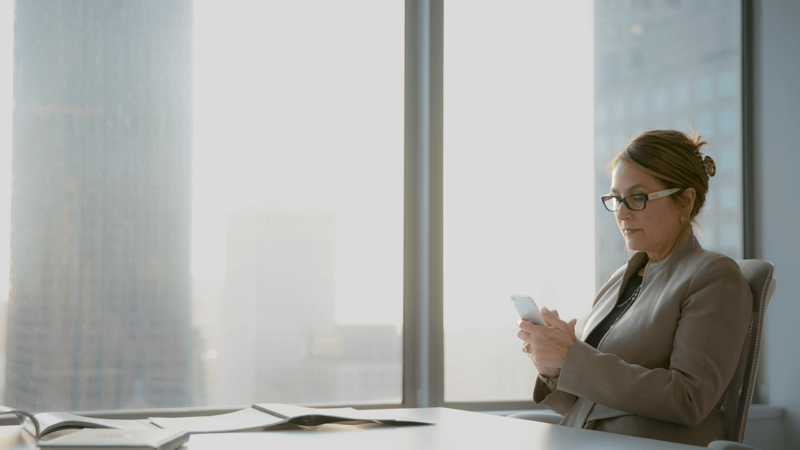 Risks from device behaviors and configurations can come from employees using jailbroken or rooted mobile devices or be as simple as not enabling a passcode on the device. 1 in 1000 of our enterprise protected iOS devices are jailbroken. 5 in 1000 of our enterprise protected Android devices are rooted. Network risks associated with behaviors and configurations are best highlighted by the example of employees using public Wi-Fi. The more "promiscuous" end-users are with connecting to public Wi-Fi, the greater the risk to enterprise data. Taking advantage of "free" Wi-Fi in airports, hotels, or coffee shops, can easily lead to a connection to non-SSL websites, which means, for example, not being encrypted when logging into mobile banking. Traveling employees may be rushing and may never know if they connect to a malicious Wi-Fi network, unknown captive portal, or a network that decrypts traffic for content filtering. Risks linked to behaviors and configurations around web and content can be summed up by an action enterprise employees do regularly: opening email attachments from unknown people or clicking links in SMS messages or other messaging apps. Those attachments and messages may contain any type of content, but tend to be media files that - when accessed - expose the organization to unacceptable risk with the potential to exploit a vulnerability or endanger compliance. The example to the left shows a global 2000 bank at high risk from network threats over rogue Wi-Fi connections encountered by traveling employees, and by auto-rooting Android malware app threats. 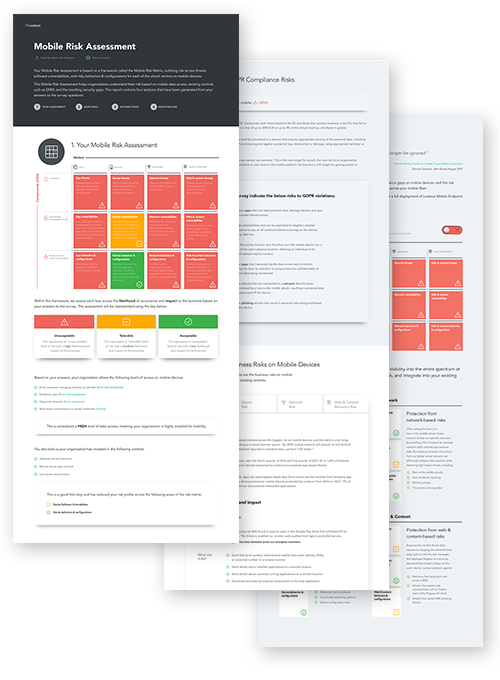 The Mobile Risk Matrix, developed by Lookout, helps organizations understand the Spectrum of Mobile Risk, and the prevalence and impact of mobile threats and vulnerabilities. 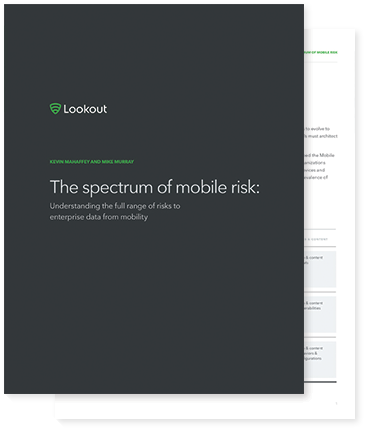 Read this exclusive research to gain insights into mobile risk from Lookout's uniquely massive global threat intelligence data.